Boyle was born on January 25, 1627, to a wealthy aristocratic family in Lismore Castle, Ireland. He attended schools in Switzerland and Italy, where he developed an enthusiasm for science while reading GALILEO’s accounts of his astronomical discoveries. From 1644 to 1654, he retired to his family estate at Stalbridge in Dorsetshire, England, and there he began to investigate pneumatics, the study of the properties of gases. 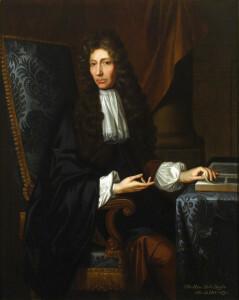 In 1654, Boyle moved to Oxford, where he began his scientific work in earnest. Enlisting the help of English physicist ROBERT HOOKE, he constructed an air pump with which he demonstrated the role of air in combustion, respiration, and sound transmission. Boyle joined a group of scholars who advocated FRANCIS BACON’s philosophy that scientific investigation should rely on the empirical evidence gained through observation and experimentation. In 1662 the group became the Royal Society for Improving Natural Knowledge, also known as the Royal Society and the Royal Society of London. Boyle attacked the traditional Aristotelian theory that all matter consists of four elements: earth, air, fire, and water. In The Sceptical Chemist (1661), he proposed that matter is made up of primary particles that coalesce into corpuscles, and that different types of matter are distinguished by the number, position, and motion of the corpuscles they contain. Boyle made numerous other discoveries. He was the first person to suggest that heat was a result of the motion of the corpuscles (molecules) and that air is a mixture of gases. He was also the first chemist to collect a gas and to devise equipment to test the properties of gases. In 1662, he synthesized the results of his experiments into what is known as Boyle’s Law, which states that pressure times the volume of a gas will be constant if the temperature is constant. For example, doubling the pressure on a gas squeezes it into half its original volume if the temperature remains the same. In 1668, Boyle moved to London, where he lived with his sister until his death on December 30, 1691. Boyle’s innovative experiments and theories set the stage for chemists in the eighteenth and nineteenth centuries to develop the theories and methodologies of modern chemistry. Boyle is known as the “father of modern chemistry”; he is thought to be the first person to have engaged in chemistry as a pure science. Although Boyle maintained some alchemical views regarding transmutation, he saw chemistry as a science distinct from both alchemy and medicine. Alchemy was a medieval art whose aims were to achieve the transmutation of base metals into gold or silver, to discover a universal cure for disease, and to find the means to prolong life indefinitely. Boyle’s extensive experimentation and rigorous application of scientific procedures distinguished his work from the alchemists of the day, who were more interested in the practical goals of transmutation and curing diseases. Although Boyle stopped short of postulating different kinds of primary elements, his corpuscular theory was significant because it was among the first to break from the dominant four­ element theory. Throughout the eighteenth century, scientists discovered new elements, as the concept of different kinds of primary elements took root. By 1800, 34 elements had been identified. Boyle’s ideas also moved chemistry toward a theory of elemental particles (atoms) and congregations of elemental particles (molecules). Boyle’s Law is among the most important mathematical relationships in chemistry. The law holds for most gases, except at extremely high pressures, and thus facilitates quantitative analyses of experiments with gases. The most common application of Boyle’s Law is to calculate the volume of gases consumed or produced by a chemical reaction. One of Boyle’s most significant contributions to chemistry was the importance he placed on experimentation and accurate observation.